Welcome Back,Today We Are Sharing A Knowledge Based Article For All The Persons Who Have Lost Or Misplaced His Aadhaar Card Or Acknowledgement Slip. Friends You Already Know That Without Acknowledgement/Resident/Enrollment Slip You Can’t See Your Aadhaar Card Status And Can’t Download Your E-Aadhaar Card And I Think A Lot Of Peoples Was Facing This Problem. So If You Are Also have In These Peoples Who Have Misplaced/Lost Acknowledgement/Resident/Enrollment Slip Or Aadhaar Card And Do Not Know The Enrollment Details, So Don't Panic/Worry Because Using These Below Simple Steps You Can Easily Download A Fresh Copy Of Aadhaar Card. So In This Post We Are Going To Explain That How To Find Lost UID (Aadhaar Number) And EID (Enrollment Number). You Have To Just Only Your Full Name (Full Name In Correct Format) And Your Mobile Number Or Email ID Which You Provided At The Time On Registration/Enrollment Of Aadhaar. 2). How to Download Your E-Aadhaar Card (Electronic Copy of Aadhaar Card). How to Find Enrollment Number EID and Aadhaar Number UID. 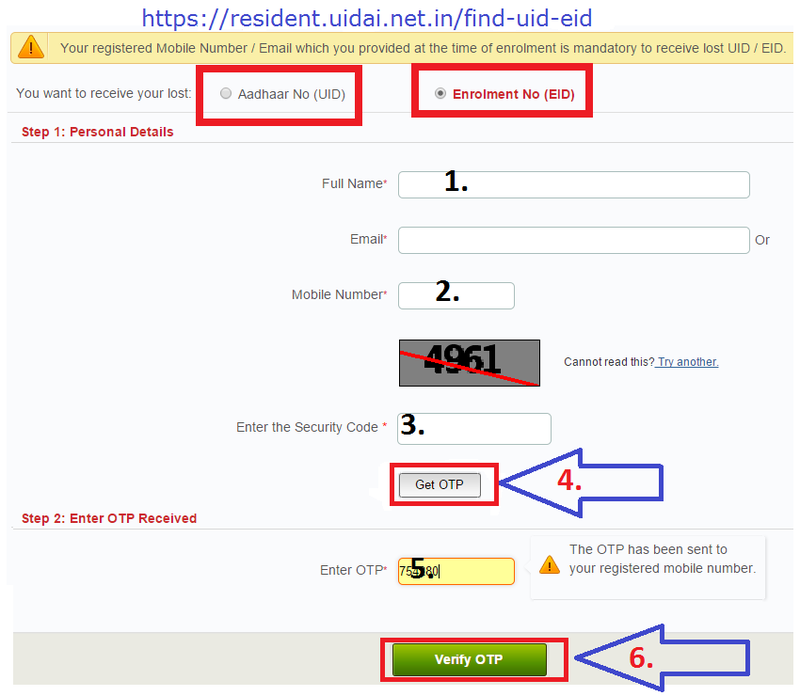 Head to the Find uid/eid - Resident Portal on the Uidai Website. 1. First Of All Go to This Link >> resident.uidai.net.in Website. 2. Select Appropriate Option, Aadhaar No – UID (If You Want To Find Aadhaar No) Or Enrollment No - EID (If You Want To Find Enrollment No) From The Two Options Near The Top Of The Screen. 3. Type Your Full Name Please Make Sure You Enter Your Full Name in Capital Letters. 4. Type Either The Email Address OR Your Mobile Number That You Used To Register For Aadhaar Enrollment. 5. Enter The Characters You See In The Image Above Enter The Security Code. 6. Click On >> “Get OTP” Button. 7. Now A One-Time Password (OTP) Will Be Sent To Your Email Address Or Phone Number, Whichever You Entered In The Form. 8. Enter This Password In The Form Next To Enter OTP (One Time Password). 9. Click On >> Verify OTP. 10. Now you will Receive Your Aadhaar Number (UID) or Enrollment Number (EID) via SMS or Email on Your Mobile Number. How to Download E-Aadhaar Card Copy. Head to the E-Aadhaar Page on the Uidai Website. 11. 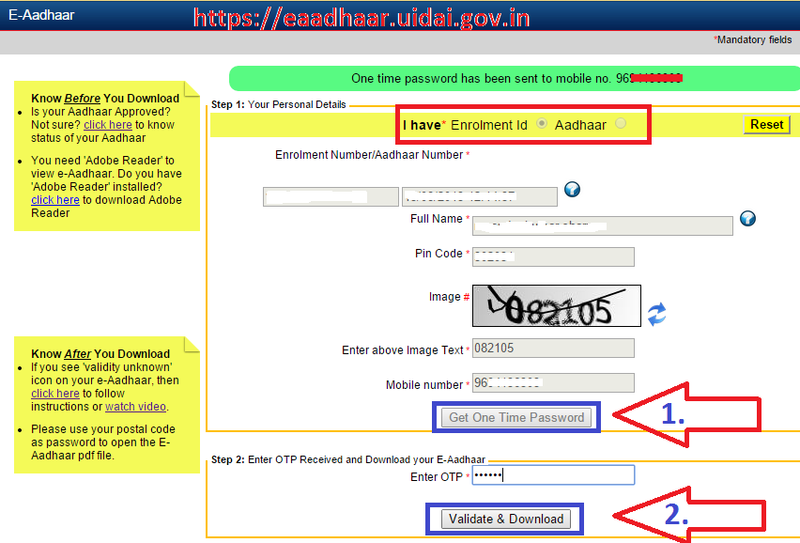 Now Go to This Link >> eaadhaar.uidai.gov.in Website. 12. Select Appropriate Option, "Enrollment ID" Or "Aadhaar", Under To "I Have:"
14. Click on >> "Get One Time Password” (OTP). 15. This One Time Password Will Be Sent To Your Mobile Number If You Click Confirm in The Pop-Up. Alternatively, You May Click Cancel And Have It Sent To Your Email Address. 16. Enter the OTP You Just Received On Your Mobile in the Box >> Enter OTP. 17. And Click On >> “Validate & Download”. 18. Now Your E-Aadhaar Card Will Be Downloaded In A Password-Protected PDF File. The Password Is the Simply the PIN CODE of Your Residential Address. You Can Now Print This File, And It Is A Fully Valid Aadhaar Card. Let Us Know If This Tutorial Helped Via The Comments. For More Tutorials, Head To Our How to Section. Hope These Processes Might Help You To Get Back Your Aadhaar Card. If You Want To More Updates, Please Visit And Like Our Facebook Page. sorry bro, mobile no. is required to find eid. please call aadhaar toll free no. 1800-300-1947. or contact to nearest aadhaar kiosk. Thanks. If you want to register mobile number in Aadhaar online visit http://aadhaarcorrection.blogspot.in/2015/10/how-to-register-mobile-in-aadhaar-online.html open comment box and write your Aadhaar number and Mobile number . bro follow above steps correctily you will definetaly get aadhaar e-copy. or you can call to cc - 1800-300-1947. thanks for comment. keep visiting. you can download aadhar card form net.visit website. sorry bro, mobile no. is required to find eid. please call aadhaar toll free no. 1800-300-1947. or Send mail on help@uidai.gov.in contact to nearest aadhaar kiosk. Thanks. pls sir tell me to how to get my aadhar without enrollment slip pls help me..
note: mobile number is compulsory to find eid no. Thanks for this article. This was very helpful.. Cheers !! Thank you @NarendraSharma for sharing this unique information with us. I found the post very useful as well as interesting. Nice And Great work this will Help me to download the enrollment. I really thanks to you for sharing this post. name, and it does it effectively and quickly. You would not believe how much space it raids off. Duplicate files deleter software helps you dash off some more space by eliminating copied or unnecessary files in bulk. This software gives forth truly what you would presume based on its name, and it does it effectively and quickly. You would not believe how much space it raids off. hi i was trying to do the above process but, it shows multiple records found, please refine yu=our query.. i have same number in my whole famile. to ca you please help me out? ?